Shamoozal.com has a pretty straightforward objective: to create "Flash Cartoons and Animation about Nintendo, Rabbits, Ninjas, Monsters and More". It's the brainchild of Phil Summers, a rabid Nintendo fan whose unique sense of humour has resulted in a series of incredibly amusing animations based on famous video games from the past few decades. Keen to learn what makes Phil tick, we sat him down in the patented Ninterview Interrogation Pod (N.I.P. for short) and pushed the big red button marked "Squeeze". The resulting juice is shown below in text form. Enjoy! Nintendo Life: Can you give us a little information on your background? What is it you do for a living? Phil Summers: Despite the fact that I graduated with a degree in animation, I've actually been a professional graphic artist for almost a decade. I never ended up pursuing animation as a full time job because working in the animation industry means you're doing a lot of contract jobs. I always just liked the idea of being able to stay at a place for an extended period of time. It's just less stressful to me than always having to find work. That said, I do love animation which is why I enjoy trying to fit it into my life. NL: When did you get bitten by the Nintendo bug? PS: Very early on. I believe I was in Kindergarden when my brother got a NES. I have two older brothers, we already had an Atari and Colecovision in the house, but the NES was the one that really grabbed me. I would say that Super Mario Bros. is what turned me into a lifelong fan of games and Nintendo. I know many people my age probably say that, but it goes to show the impact that game had on an entire generation. NL: Where do the ideas for your animation projects come from? PS: For Read Only Memory it was simply a matter of choosing some of my favourite games and seeing what I could pull from them. For the shorts that make up ROM Vol 1, I was certainly going for jokes and visual gags. About midway through the shorts that make up Vol 2, I decided to kind of ease up on the jokes and try and capture moments and feelings from the games. This is especially so in Take a Key for Coming In and Link's Triumph. For much of my older, pre-ROM work, I would usually come up with a few gags and think of ways to build around them. NL: How long does it take to put together each animation? PS: It really depends on the scope and scale of the project. Something simple like Turnips In Love, I was able to belt out over a weekend. Link's Triumph on the other hand was months of work. Towards the end of that project I'd say I worked on it enough to where it was like having a second full time job. Some cartoons go through rough patches. I started Contra with Two Players, worked on it for two months, became frustrated and then moved over to Link's Triumph. I hit a tough spot with that and ended up bouncing back to Contra and wrapped that up a few months later. I was actually kind of scared to move back to Triumph after Contra because I knew the effort that would have to go into it, so that was where I planned Take a Key for Coming In. On a whole, the shorts that make up ROM Vol 2 are much more complex than anything I created for Vol 1. NL: What kind of tools and software do you use? PS: I mainly use Adobe Flash. All of the animation is done by hand in Flash with a Wacom Cintiq 12WX. Most of the backgrounds are painted in Adobe Photoshop. I do my editing with Adobe Premier. I also used a bit of Adobe After Effects with Link's Triumph. I painted stuff like the flames the dragon breaths by hand, but I used After Effects to give them the glowing effect that they have. NL: Link's Triumph is one of your most accomplished productions yet. What tone were you aiming for with this one? PS: Thank you! I really wanted to capture what I felt was the heart of a Zelda adventure, which is an average boy overcoming great odds. Since the short is only around 50 seconds in length, it becomes very hard to tell a story within that time span, especially when it is taking place in the middle of a fight. Because of that, I had to make every single frame matter. 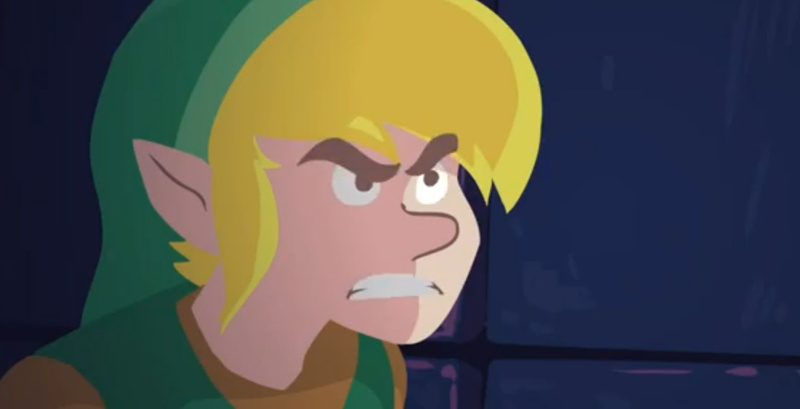 I tried to show a range of emotions that we normally don't see from Link to help set the tone for the short. I really wanted to give personality to Link, and I think that idea is what helps make the battle not only exciting, but something the viewer finds themselves caring about as it unfolds. NL: What's your favourite Nintendo series, and why? PS: That is a really tough choice. Choosing my favorite Nintendo franchise between Super Mario, Zelda and Metroid is liking asking me to pick my favourite child. They all scratch a different itch, and as long as Nintendo keeps making them, I'll keep buying Nintendo consoles. NL: What are your thoughts on the Wii U? PS: I think it's a great console, though maybe a little under-cooked as far as software goes. Off-screen play is the only reason I found time to work my way through New Super Mario Bros. U, so that feature alone makes it worth it. I hope more games do off-screen play in the future. I also love the Miiverse and Nintendo Land is super charming. That said, those are the only two games I own for it and I've had it since launch. The delays for stuff like Pikmin 3 are disheartening, and the lack of a solid software line up for the near future is especially perplexing. I'm sure the end of the year will be awesome for it, it's just going to be a long road until that point comes. NL: A lot of your animations focus on games made famous by the NES. Is this your favourite Nintendo console? PS: You know, I always thought the SNES was my favourite Nintendo console, but I think as I've gone on with Read Only Memory that I realized the NES is my favourite console of all time. My childhood is attached to those two machines, but the NES is the one I still buy games for quite regularly. I think with Vol 1 that the games all being based around NES games was an accident. I had ideas for stuff like Star Fox, but with Vol 2 it was very intentional to go with NES-only games. Especially NES games before a certain date. Hopefully everyone will see what I mean when the ROM Vol 2 compilation video comes out in the near future. NL: You've covered Zelda, Mario, Castlevania, Contra and Ghouls 'n' Ghosts - what's next for Read Only Memory? PS: It's funny, I'm not even sure myself! It was a long journey creating ROM Vol. 2 and now that I'm at the end of it things are up in the air. I'm tempted to create something original, but I'm also getting a slight demand to create a Legend of Zelda series. I would not expect a series of shorts that would make up a third volume of Read Only Memory, but I'll likely be doing something game-related in the future. We'll see! Thanks to Phil for taking the time to talk to us. You can check out the entire Read Only Memory series - plus all of the other amazing Shamoozal videos - on Phil's YouTube channel. This guy is really talented and pretty funny. Can't wait to see some more toons. I would personally like to see one on sonic and Dr.Eggman. Thanks for flagging this; he's a talented guy. I wonder if there's someone doing something similar with Master System/Megadrive games? The pizza Links video was hilarious! Good job Shamoozal! My fav is probably the castlevania one. Great humour. The maggots cracked me up. The installing the NES was great too, I LOL'd at the size of the power pack. Brought back all those blowing the cartridge and jiggling the cartridge memories. Phil is talented! Great videos and interview!